FUNKY DONKEY HAS RELOCATED!!! NEWLY RENOVATED AND BETTER THAN EVER! 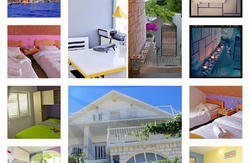 All backpackers of the world come and experience our hospitality! We are situated only 10.5 minutes from the main ferry port and from all the town's attractions. Our comfy beds and backpack size lockers, free Internet and laundry service provide for your basic needs. The common area offers a wide selection of DVDs, book exchange and a range of social games. Our hostel is also equipped with kitchen facilities and balconies bathed in the sunshine. With chill out tunes, BBQs and cold beer and homemade liquers on sale, it sets the mood for partying till signs of the first morning sun. If you want to explore the island, join us on our day trips. The young international and chatty staff will supply you with all tips on where to eat, drink and party in Supetar. From the main ferry port, walk straight down the street Hrvatskih Velikana. On this street there will be signs for ZagrabaÄka banka..Keep following the signs and the street until you get to a street sign that saids 'Policija'. There will be a funky donkey poster under it. Turn right into the street and follow it until you get to a cross road. There will be a sign for zagrebaÄka banka. Turn left and follow the sign until you see the zagrebaÄka bank. We are two houses to the right of the bank and there is a scooter shop to the left of us.